We had a great time this week with our fieldtrips and family time! We went to a great art museum, met up with our homeschool group at Chick-fil-a, built keepsake boxes at the Home Depot kids workshop, built Lego lemonade stands at Toys R Us and Gwyn and Ben went to Daddy Daughter Date Night at Chick-fil-a. The Booth Western Art Museum in Cartersville, GA was absolutely amazing. I had heard about the museum at the SE Homeschool Expo but was under the impression that it was just a small local museum. Well I was wrong and pleasantly surprised. It is a 3 level, 120,000 square foot Museum. It opened in August 2003, and houses the largest permanent exhibition space for Western art in the country. Galleries feature contemporary Western American art, historic Western art, Civil War art, Presidential portraits and letters, Western movie posters, and Western illustration. And the kids favorite part Sagebrush Ranch an interactive gallery where children of all ages can learn about art and Western America. If you live in GA make sure you check out the homeschool day on March 8th 1pm-4pm. 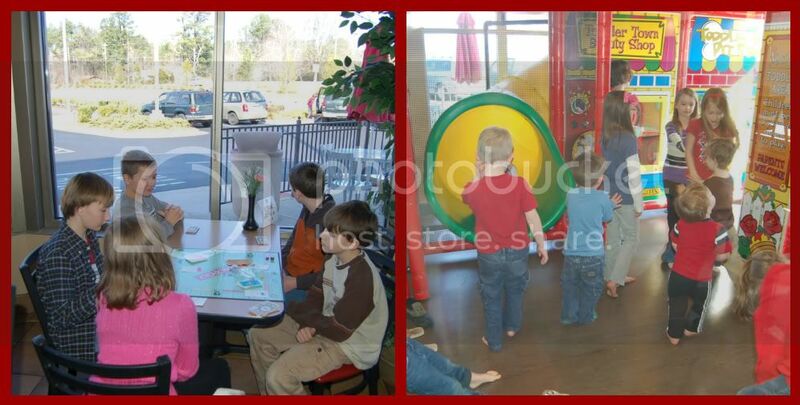 About once a month our homeschool group, North GA Homeschoolers meets up at Chik-fil-a for some homeschool PE, board game playing and socialization! The mothers chat while the kids play. It is a lot of fun. On Saturday we hit up Home Depot for the kids workshop and the kids made keepsake boxes, afterwards we went to Toys R Us to participate in the Alex's Lemonade Stand Event. Wanna find out how you can get involved and help raise money to put the squeeze on cancer? Visit the Alex's Lemonade Stand website and find out more about the National Lemonade Days on June 8th-10th. We are planning to participate with our homeschool group. An amazing little girl who was diagnosed with cancer at the age of 1. At age 4 she decided to set up a lemonade stand to help raise money to find a cure. Sadly she lost her fight against cancer at the age of 8. But she helped raise over 1 million dollars over those short 4 years. Alex’s Lemonade Stand Foundation was started by her parents in 2005 to continue the work that Alex began. Then Saturday night Gwyn and Ben had their very first date night thanks to Chick-fil-a. Apparently Chick-fil-a does this special even once a year around February. Each location does something different. Gwyn got her face painted and got a little goodie bag and a rose. They even gave each father a little brochure with some conversation starters. Looks like you guys had a GREAT week! So happy you are able to get out and do a little more! Rob and Jess had their date tonight, too....it's always a special time! HUGS! you are a rock star! what a great time in the community! you did a fabulous job rounding it all up - very cool - wishing the homeschool day at the Western Museum was the following week cause. . . you know. . . we could go together . . . cause I'll BE THERE WITH YOU - woot woot! Lots of fun! I have always wanted to try out one of those Home Depot workshops, but here they are always on Saturday, and we always have so much other stuff going on! Thanks for linking up to FTF!